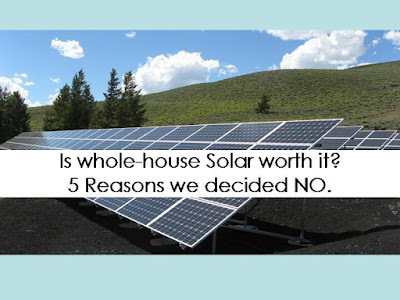 Is Whole House Solar Worth it? 5 reasons we decided No. 2. Laws Change and they can be volatile. Solar has been killed easily in other states (check out Nevada) by making sweeping changes to legislation. In one foul swoop we could go from saving money to having our net benefit completely wiped out. Solar laws and federal mandates I do believe will ultimately catch up to demand but we are not 100% there yet. It scared me to invest $28,000 in something that still feels so vulnerable to change. 3. ROI and time to payback didn’t work. – So, best case with the optimal use and sun exposure we pay $0 a month. With our usage that would save us about $2,600 annually. That made it about an 8 year pay off. Meaning, we would pay our bill upfront for (at least) the next 8 years. In essence, we would just be ‘prepaying’ our utility bill. So, by year 2025 (hopefully) we would see some benefit? That would mean we needed to guarantee we would be in our house at least another nine years for it to make sense. Would we? We were not 100% sure on that Either. Another bummer. 4. Technology tends to improve and fast. – So it’s an 8 year payback? When we think about our lives 8 years ago and where technology and cost were for solar then vs. now, that too made us nervous. Elon Musk and his Solar City company are creating new innovations in solar daily. It feels like these bulky $28,000 panels could be out of date soon, The installers assured us that some of the new technology is years and years away. That could be true, but if you told me 10 years ago I would hold a device in my hand that can do what my iphone 6 could do, I would have said you were crazy. It feels like solar will go the same way. Strike 4. 5. Our roof can’t hack it- Installing nearly 50 panels on our roof and drilling holes (even if they are small) seems like it could ultimately cause a lot of damage. 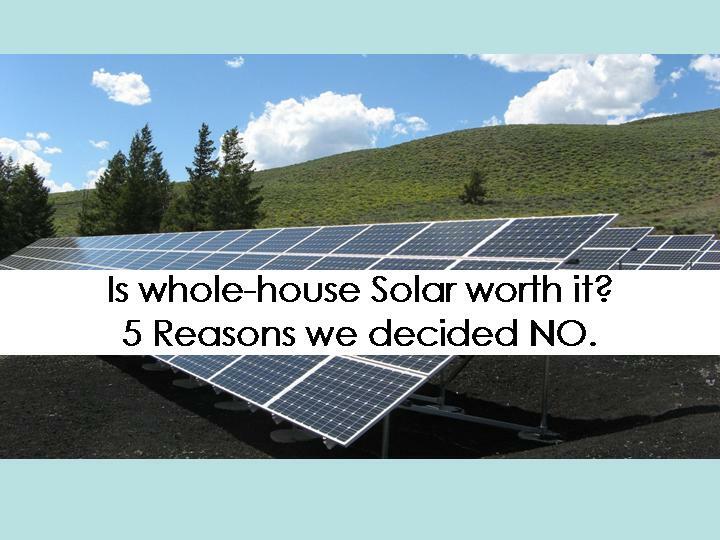 We consulted a roofer who said roofers really don’t love solar because it can ruin your roof when installed improperly. Our home is the largest investment we will ever had so even if this last reason is a bit weak, it was still enough to put us over the edge to say that for now it is a no for us. Ultimately, we decided, at this point it’s not worth the investment and we were literally evaluating one of the best times to buy and one of the lowest cost options anywhere. It’s just not time for us and we are just not ready yet. I am hopeful that solar technology will get cooler, faster, cheaper, and one day soon it will feel like the 100% right decision, but for now we will still be paying the power company. Lucky for you- and for me- that means more blogs on ideas we can implement to even further reduce our monthly power bill in other ways. We already have a lower bill than nearly all of our close friends with similar size houses. Crappy non-energy efficient Air conditioner and hot water heater watch out. Your time is coming to an end soon.